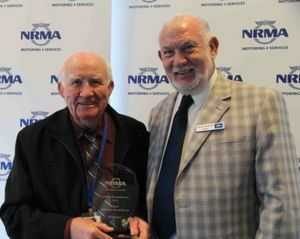 The NRMA Helping People Awards recognise the selfless contribution of local volunteers who are motivated by a simple desire to give back to their community. Nearly 600 volunteers were nominated by their peers and TAD Disability Services volunteer Bill Jenkins was awarded the Senior Volunteer Award. Bill has volunteered at TAD Disability Services for 20 years building hundreds of custom designed equipment from his garage for people with disabilities. A fitter by trade and an engineer, he uses these skills to make bath chairs, standing frames and other custom equipment to improve the independence and daily lives of children and adults with cerebral palsy. At 82 years of age, he still likes to volunteer because it helps to fill the time while helping people. Bill also volunteers fortnightly at St Vincent de Paul meeting and distributing food vouchers to individuals and families doing it tough. Bill was awarded a very well deserved holiday to the value of $2500 from NRMA Travel and TAD Disability Services received a $5000 donation.